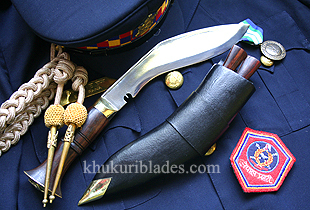 Khukri being the national knife of Nepal, it is issued to all Nepalese forces including the Nepal Police. This khukri is slightly different than issued to the army. It is a little heavier, more curved and with a bit more widht making it more effective during use. Rosewood is used for the handle and khukri insignia is fitted at the end cap of the handle to represent Nepal Police. The khukri is retained throughout police career and regularly inspected by senior officers. It becomes a prize collection and reminder of their loyal service to the country after retirement. © 2006-2018 Khukuri House Thamel. All rights Reserved.